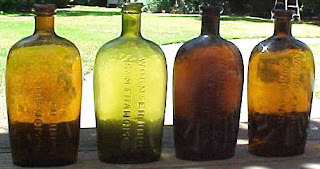 Those color runs of Cutter cylinders and Wormers Bros' flasks are terrific, especially the true green cylinder and flask, those are not often found or seen. 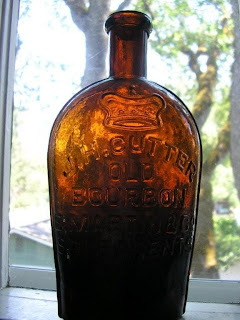 The Cutter flask is indeed a beautiful example, very dark, heavy and really whittled! 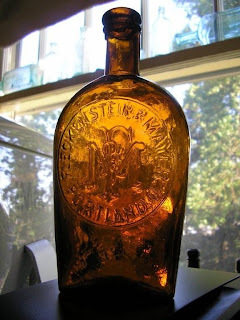 This example almost makes me want to collect western flasks, I do have a soft spot for this category of bottles. to rub the soft spot. Outstanding Cutter flask. Thanks for sharing. That "just another Cutter" was once mine, but it now graces another shelf. Interesting that I have actually owned 1/3 of the known examples of this flask, and upgraded each one until this specimen. I have only seen two in this dark chocolate coloration, as most are a medium, to golden shade. There are a few very light yellow ones as well. This one is extremely heavy, and has thick glass with incredible whittle. The strike is what tipped me over, with every little detail boldly embossed.Dug by KZ, I am happy to have it on my shelf! M.E. My ole diggin partners (K & M) dug that Cutter flask off of San Pablo Ave in Oakland about 20 yrs ago in a pit that was absolutely chucked full o' flasks. 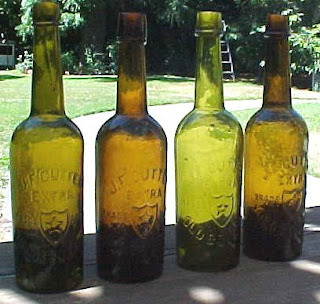 There was a wild yellow one whittled as well that had a hole in the shoulder, and a Lilienthal amber coffin, many many unembossed union ovals, and several embossed punkins ! Most of the dark amber examples I've seen have average to weak strikes except for a few, one of which I owned that was dug in Chinatown SF. AP, you still have that one from the Santa Cruz dig? No, I dug myself a real nice yellow amber example about 8 yrs ago and sold the one you speak of to the whiskey museum in Redding. I considered it among the top 3 examples.